The day before New Years Eve, I thought to myself that it would be nice to pull out a quality beer as I knew I was going to crack open Rare Bourbon County Stout the next day, so I needed something that could lead me in to such a big American craft beer. Nemesis 2009 by Founders, which had been aging in the cellar for nearly year, seemed to be the perfect fit. I have heard good things about this annual release, with each being a bit different than the previous. Time to take the plunge. Needless to say, I was excited for this tasting and review. After the physical eying of the beer, it was all down hill for me: the aroma and taste just wasn’t what I expected. Flavors seemed to be off and not well balanced. The drinkability suffered because of this. A bit of a let down. For the difficulty I had obtaining this beer (called and drove all over the place) and the cost (nearly $6 per bottle and some places raised the price to gouge), this version of Nemesis falls short. After looking at my review and points, I actually believe I over rated this beer. Just give me my KBS and I will be happy. Enjoy! Useless Fact: Nerve impulses to and from the brain travel as fast as 170 miles (274 km) per hour. Had to make up for taking last night off with an array of four seasonal beers and a Curmudgeon to keep me honest. 🙂 I am about half way through the beers from Two Beer Dudes Oktoberfest festival. 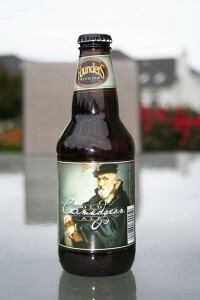 Curmudgeon by Founders Brewing Company is an Old Ale that has been aged in oak barrels. I had six of these before I could pull myself away from the glass long enough to review it. Molasses, grain, vanilla, and dark fruit are part of the complex aroma and taste of this beer that blend together nicely to make one fine drinking beer. Slight dryness and warmth that compliment this beer perfectly. I hope I can still get some more of this. Ichabod by New Holland Brewing Company is a pumpkin beer. Ichabod is a quality offering that didn’t live up to the aroma in the taste. I thought the aroma was spot on and had me preparing for a great taste but I was let down when the beer was a little light and watery. 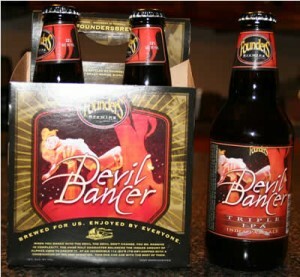 If you prefer your pumpkins not as spiced up in the mouth, then this would be a really good beer. air max 90 femmes In spite of what I said, I would have this beer again. 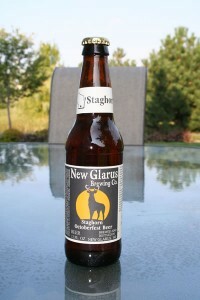 Staghorn Oktoberfest by New Glarus Brewing Company was next. I cant’ hide the fact that I am a fan of Glarus beers as I have been there twice this summer and tasted/reviewed at least 18 different styles. Staghorn delivers with spot on interpretation of the style. Great combination of malts and drinkability make it a winner in my book. Punkin Ale by Dogfish Head Craft Brewed Ales found its way into my glass next. I felt the aroma was similar to Ichabod but where it left off, Punkin Ale delivers by carrying over the pleasant aroma into the taste. A well rounded and crisp offering. The last beer of the day was Gemuetlichkeit Oktoberfest by Tyranena Brewing Company. To this point I have been a fan of Tyranena’s beers but this one just seemed a little lackluster and couldn’t find the style. Order of preferences: Curmudgeon, Staghorn Oktoberfest, Punkin Ale. Ichabod, Gemuetlichkeit Oktoberfest. Enjoy! Oh, what a sigh of relief, another Wednesday and another beer store visit. Why can’t I spend 8 hours a day in the beer store and only 20 minutes per week at work? That would make me so happy. I believe my stress level would drop exponentially. I wonder what play I could devise to make this become a reality? The wheels are turning. Travis was at lunch when I arrived, which shortened my trip. It isn’t the same when you don’t have your own special guided tour with a really knowledgeable person to take you on said tour. Air Jordan Femme Needless to say, I have to go on memory of what is new and what has been there. I am sure there are a few things I missed but Curmudgeon from Founders Brewing was sitting right in the middle of the isle and, I believe, it had a spotlight shining down upon it. I had some one year, oak aged Curmudgeon at Great Lake Brew Fest about a month ago. Outstanding. I look forward to having one (or more) this weekend as I celebrate my 40th birthday. Enjoy!